Looks like a few of you are familiar with the phrase. Somehow this one seemed appropriate…. A shot of what I have been spending all my spare time working on. We are having lots of fun working on the kitchen in our farmhouse, and here is a picture of some of the work in progress. Since all the walls are still original plaster, and were in need of some work, we decided to apply stucco over all of them to hide all the imperfections. This gave it all a very Mediterranean look, which is great since Vita (my wife) is Mediterranean (Italian). Using the laser cutter we cut some stencils and lettered the top of the cabinets “Mangia alla… …Cucina di Vita”, “Eat at the kitchen of life” or “Eat in Vita’s kitchen”. Its a bit hard to see the writing on the left cabinets in this picture. 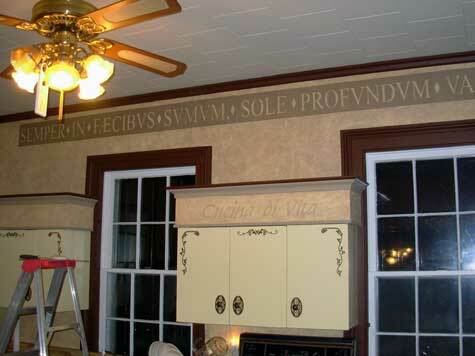 Now, I am applying some stenciling above the cabinets on the wall just below the ceiling. The stencils are all in place as can be seen in the top of the image. 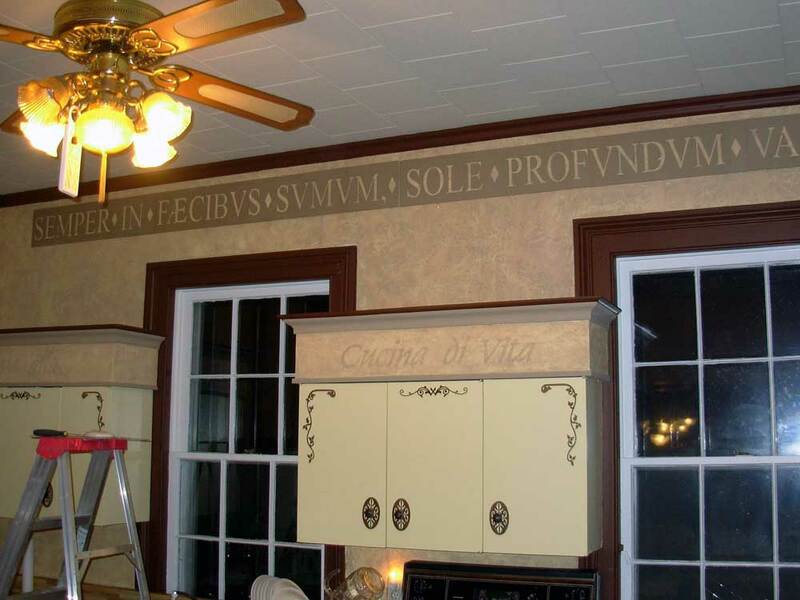 Any Latin experts know what it says? The last word is “VARIAT”, its cut off in the picture. I’ll post the answer shortly….